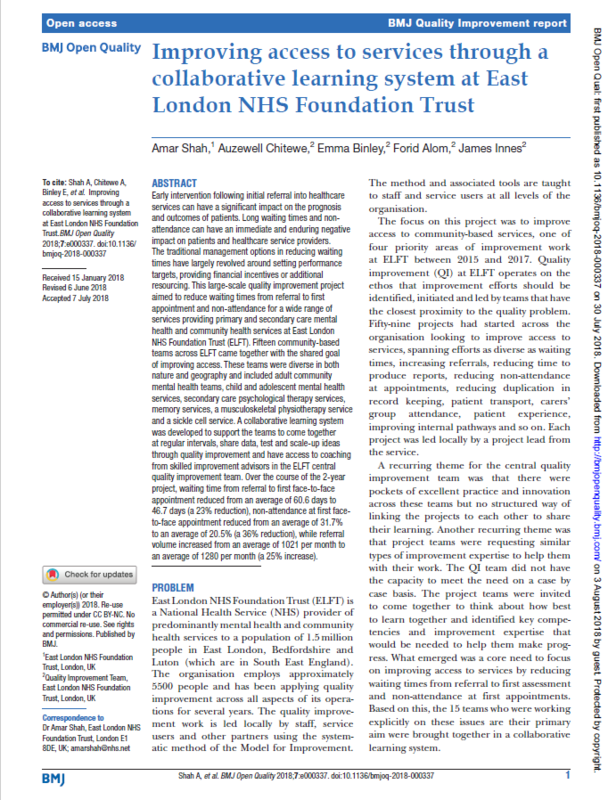 Please find our collection of East London NHS Foundation Trust QI Projects that have been published leading healthcare journals. We encourage QI project teams to write up their completed and successful improvement work and submit for publication. To make this process easier for people we have partnered with BMJ Quality Improvement Reports, a worldwide journal and repository of global quality improvement evidence and best practice. Adults presenting to oral and maxillofacial surgery services are at high risk of psychological morbidity. 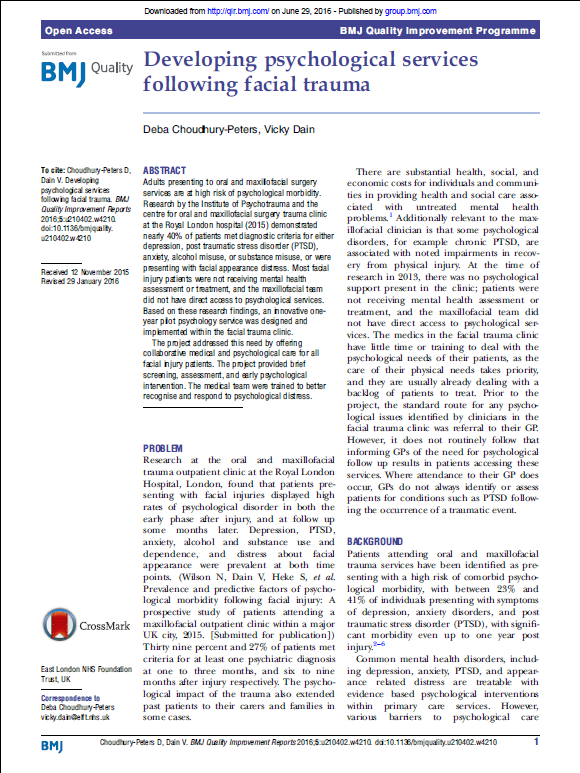 Research by the Institute of Psychotrauma and the centre for oral and maxillofacial surgery trauma clinic at the Royal London hospital (2015) demonstrated nearly 40% of patients met diagnostic criteria for either depression, post traumatic stress disorder (PTSD), anxiety, alcohol misuse, or substance misuse, or were presenting with facial appearance distress. The project addressed this need by offering collaborative medical and psychological care for all facial injury patients. The project provided brief screening, assessment, and early psychological intervention. The medical team were trained to better recognise and respond to psychological distress. Employment has been proven to be an effective recovery tool and therapeutic intervention for those with severe and enduring mental health conditions. Aside from monetary reward, employment is a means of structuring time and provides a sense of worth and achievement, which enhances self-esteem and confidence. A social identity is developed through employment, encouraging social support and increasing social networks. 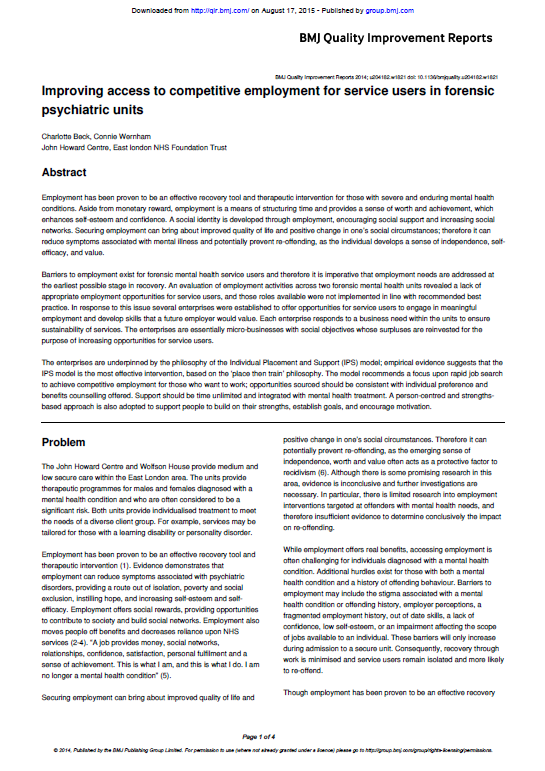 Securing employment can bring about improved quality of life and positive change in one’s social circumstances; therefore it can reduce symptoms associated with mental illness and potentially prevent re-offending, as the individual develops a sense of independence, self-efficacy, and value. The enterprises are underpinned by the philosophy of the Individual Placement and Support (IPS) model; empirical evidence suggests that the IPS model is the most effective intervention, based on the ‘place then train’ philosophy. The model recommends a focus upon rapid job search to achieve competitive employment for those who want to work; opportunities sourced should be consistent with individual preference and benefits counselling offered. Support should be time unlimited and integrated with mental health treatment. A person-centred and strengths-based approach is also adopted to support people to build on their strengths, establish goals, and encourage motivation. Adherence with anti-psychotic monitoring guidelines is notoriously low nationally. Without active monitoring and measures to improve metabolic abnormalities, more patients may develop related morbidity and mortality. 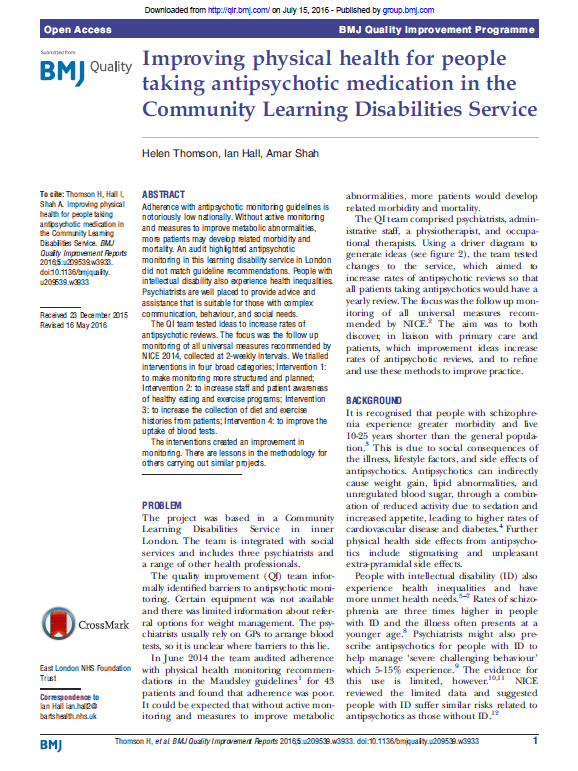 An audit highlighted anti-psychotic monitoring in this learning disability service in London did not match guideline recommendations. People with intellectual disability also experience health inequalities. 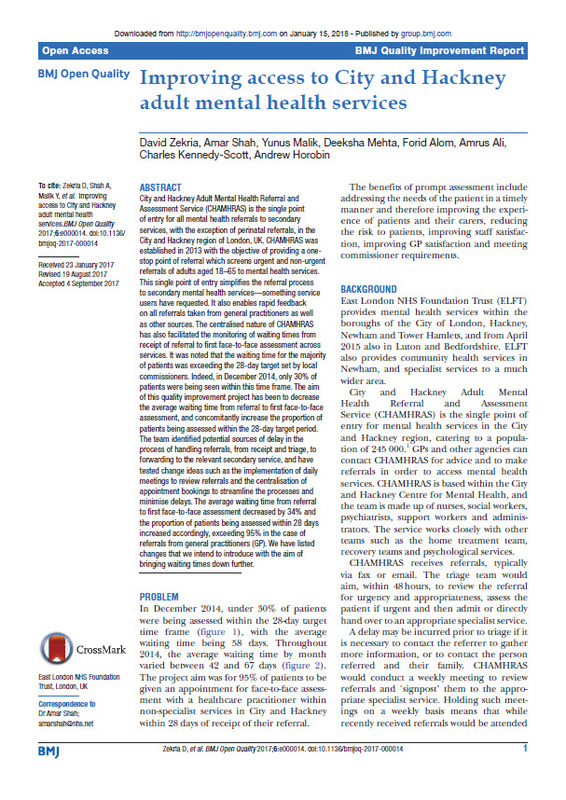 The QI team tested ideas to increase rates of anti-psychotic reviews. The focus was the follow up monitoring of all universal measures recommended by NICE 2014, collected at 2-weekly intervals. 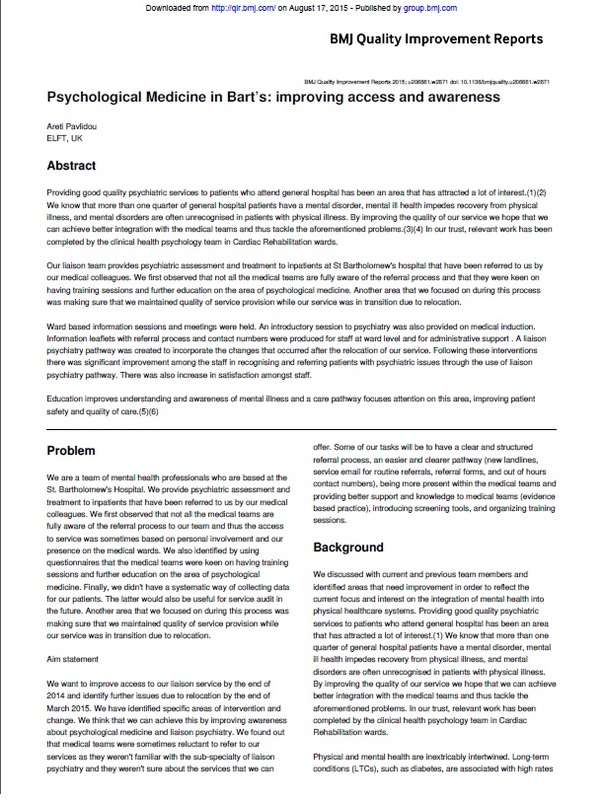 We trialled interventions in four broad categories; Intervention 1: to make monitoring more structured and planned; Intervention 2: to increase staff and patient awareness of healthy eating and exercise programs; Intervention 3: to increase the collection of diet and exercise histories from patients; Intervention 4: to improve the uptake of blood tests. 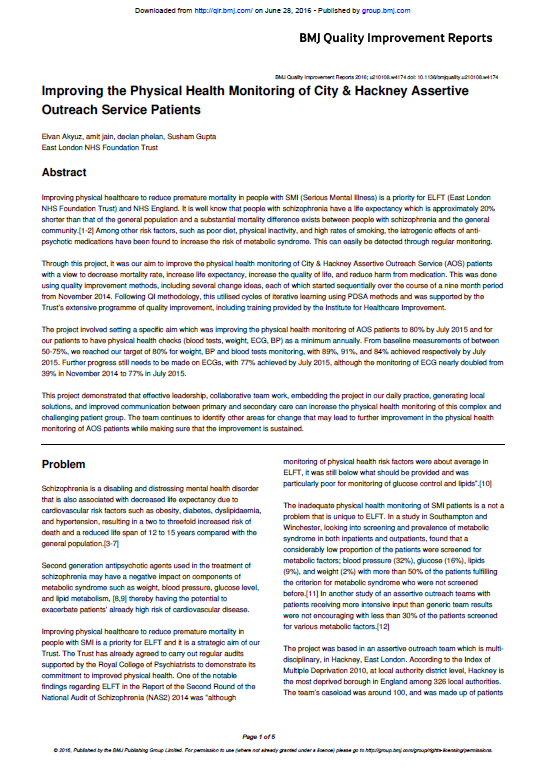 Improving physical healthcare to reduce premature mortality in people with SMI (Serious Mental Illness) is a priority for ELFT (East London NHS Foundation Trust) and NHS England. It is well know that people with schizophrenia have a life expectancy which is approximately 20% shorter than that of the general population and a substantial mortality difference exists between people with schizophrenia and the general community. [1-2] Among other risk factors, such as poor diet, physical inactivity, and high rates of smoking, the iatrogenic effects of anti-psychotic medications have been found to increase the risk of metabolic syndrome. This can easily be detected through regular monitoring. 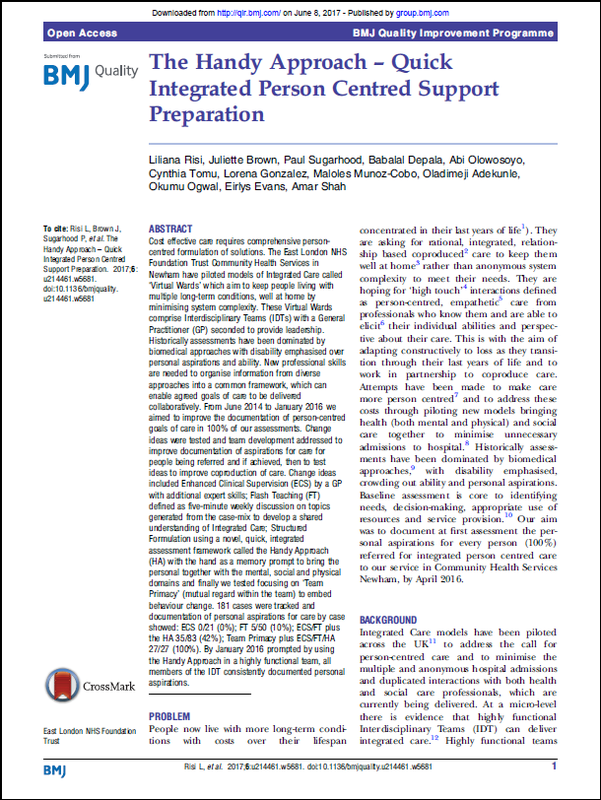 This project demonstrated that effective leadership, collaborative team work, embedding the project in our daily practice, generating local solutions, and improved communication between primary and secondary care can increase the physical health monitoring of this complex and challenging patient group. The team continues to identify other areas for change that may lead to further improvement in the physical health monitoring of AOS patients while making sure that the improvement is sustained. Information technology (IT) systems are being utilised with increasing frequency at the prescribing and dispensing stage of the medicines-use process in UK hospitals. However, much less development has taken place with regard to the implementation of IT systems at the administration stage of medicines-use. As a standalone device, the ADC was found to improve the efficiency of the medicines-use process, but had little meaningful effect on medication administration error rate at ELFT. 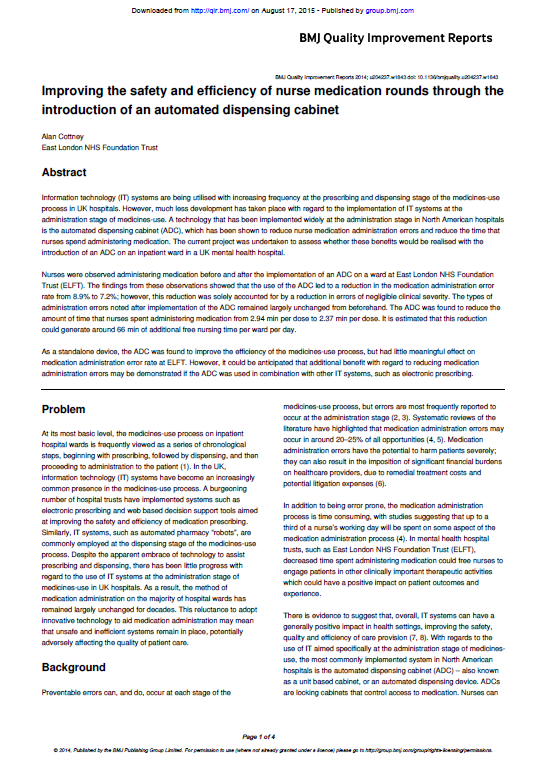 However, it could be anticipated that additional benefit with regard to reducing medication administration errors may be demonstrated if the ADC was used in combination with other IT systems, such as electronic prescribing. Providing good quality psychiatric services to patients who attend general hospital has been an area that has attracted a lot of interest. (1)(2) We know that more than one quarter of general hospital patients have a mental disorder, mental ill health impedes recovery from physical illness, and mental disorders are often unrecognised in patients with physical illness. By improving the quality of our service we hope that we can achieve better integration with the medical teams and thus tackle the aforementioned problems. In our trust, relevant work has been completed by the clinical health psychology team in Cardiac Rehabilitation wards. Education improves understanding and awareness of mental illness and a care pathway focuses attention on this area, improving patient safety and quality of care. IAPT (Improving Access to Psychological Therapies) is a national programme aimed at increasing availability of evidence based psychological therapies in the NHS. IAPT is primarily for people who have mild to moderate, common mental health difficulties such as depression, anxiety, phobias and post traumatic stress disorder (PTSD). The programme seeks to use the least intrusive method of care possible to treat people at the time when it will be of most help to them. Individuals are able to self-refer into most IAPT services or alternatively can request to be referred by their GP or other services in the community. The unintentional omission of medication is one of the most commonly-reported administration errors on hospital wards throughout the world. The omission of a dose of medication can severely harm the patient affected, but to date there is limited evidence about cost-effective means for reducing the incidence of such errors. 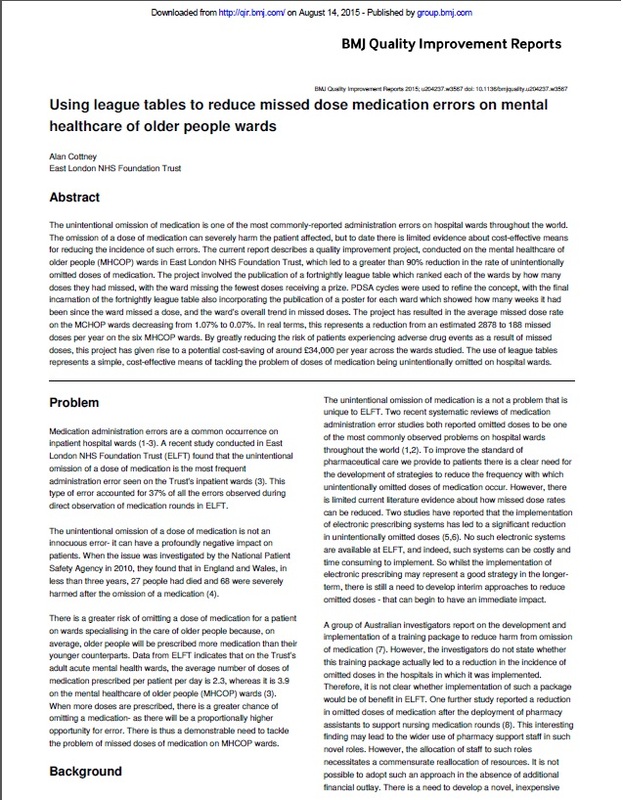 The current report describes a quality improvement project, conducted on the mental healthcare of older people (MHCOP) wards in East London NHS Foundation Trust, which led to a greater than 90% reduction in the rate of unintentionally omitted doses of medication. 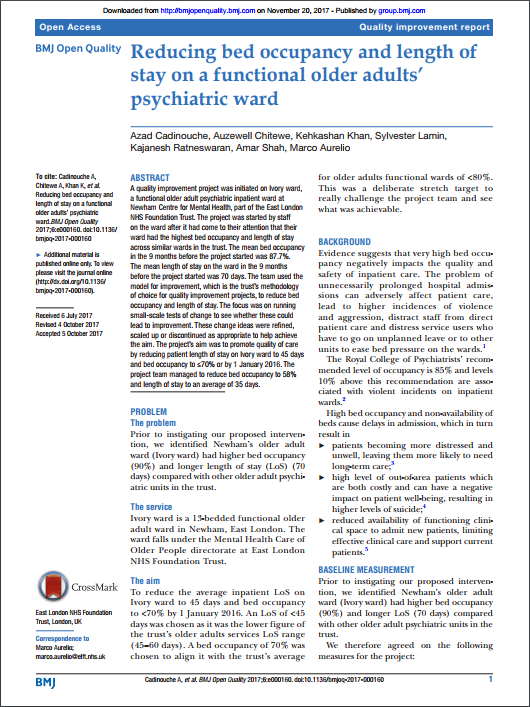 The project involved the publication of a fortnightly league table which ranked each of the wards by how many doses they had missed, with the ward missing the fewest doses receiving a prize. 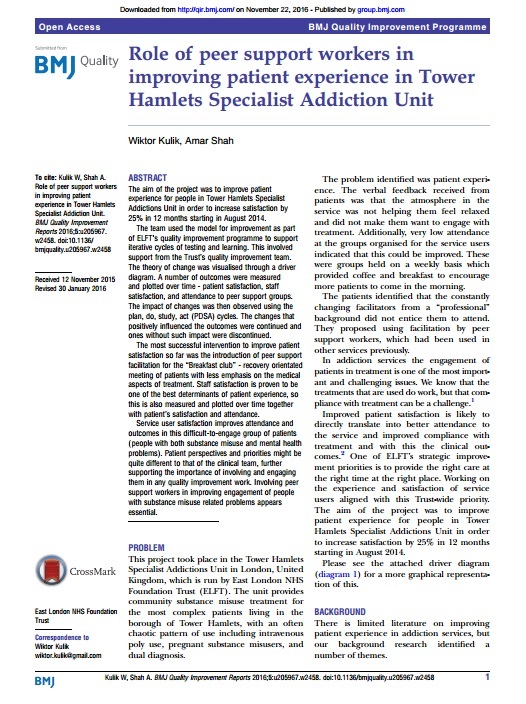 The aim of the project was to improve patient experience for people in Tower Hamlets Specialist Addictions Unit in order to increase satisfaction by 25% in 12 months starting in August 2014. The team used the model for improvement as part of ELFT’s quality improvement programme to support iterative cycles of testing and learning. This involved support from the Trust’s quality improvement team. 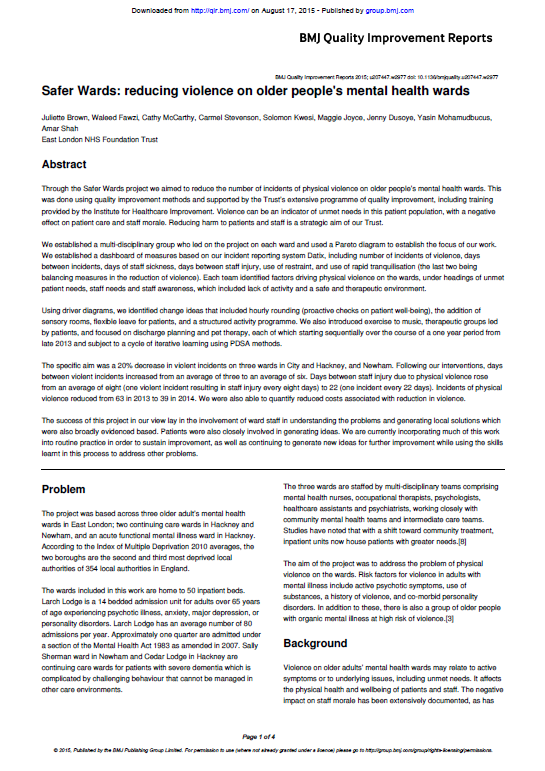 In the low stimulus environment project, we aimed to reduce the levels of intrusive background noise on an older adult mental health ward, combining a very straightforward measure on decibel levels with a downstream measure of reduced distress and agitation as expressed in incidents of violence. 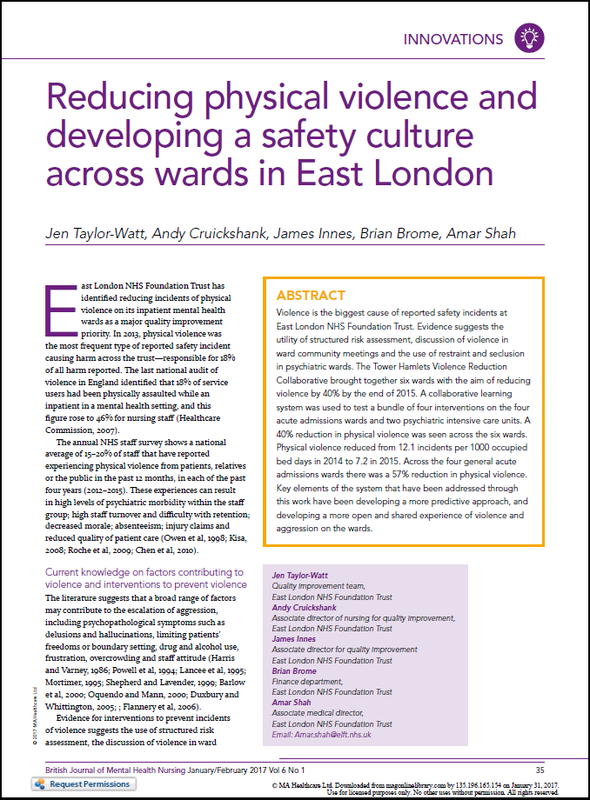 This project on reducing background noise levels on older adult wards stemmed from work the team had done on reducing levels of violence and aggression. The opportunities for service users to develop skills for more independent living and take control of their environments are limited in secure mental health units. 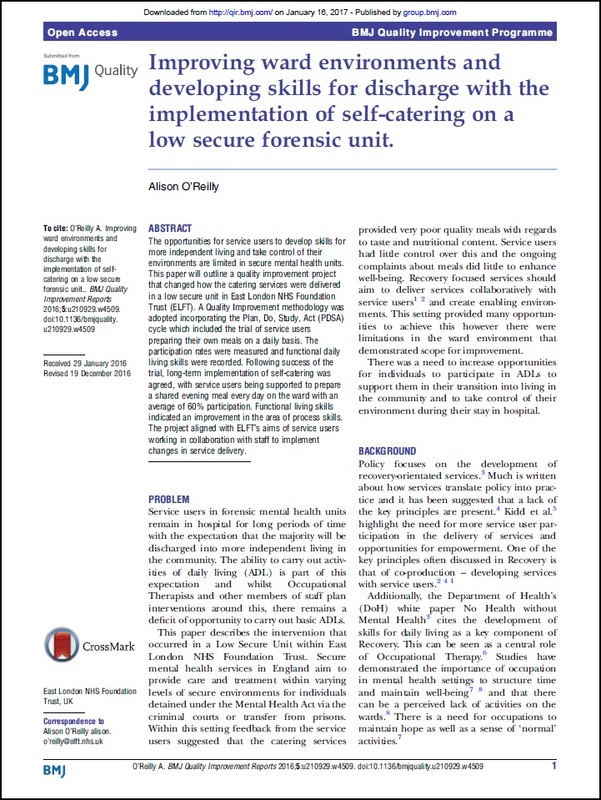 This paper will outline a quality improvement project that changed how the catering services were delivered in a low secure unit in East London NHS Foundation Trust (ELFT). 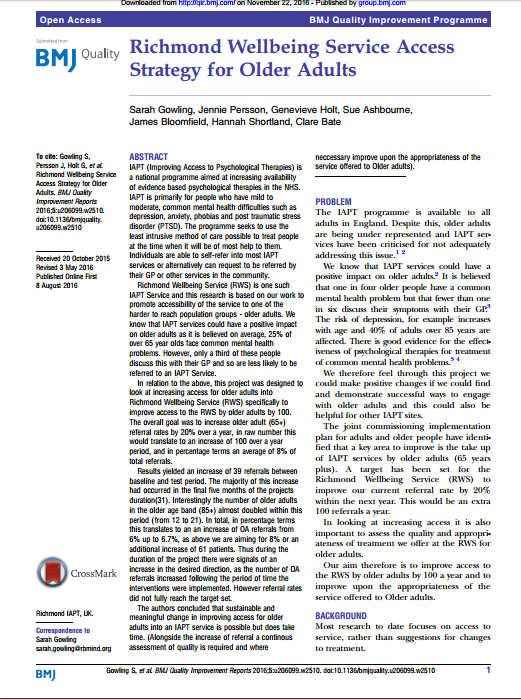 A Quality Improvement methodology was adopted incorporating the Plan, Do, Study, Act (PDSA) cycle which included the trial of service users preparing their own meals on a daily basis. The participation rates were measured and functional daily living skills were recorded. Following success of the trial, long-term implementation of self-catering was agreed, with service users being supported to prepare a shared evening meal every day on the ward with an average of 60% participation. Integrated Care models have been piloted across the UK to address the call for person-centred care and to minimise the multiple and anonymous hospital admissions and duplicated interactions with both health and social care professionals, which are currently being delivered. 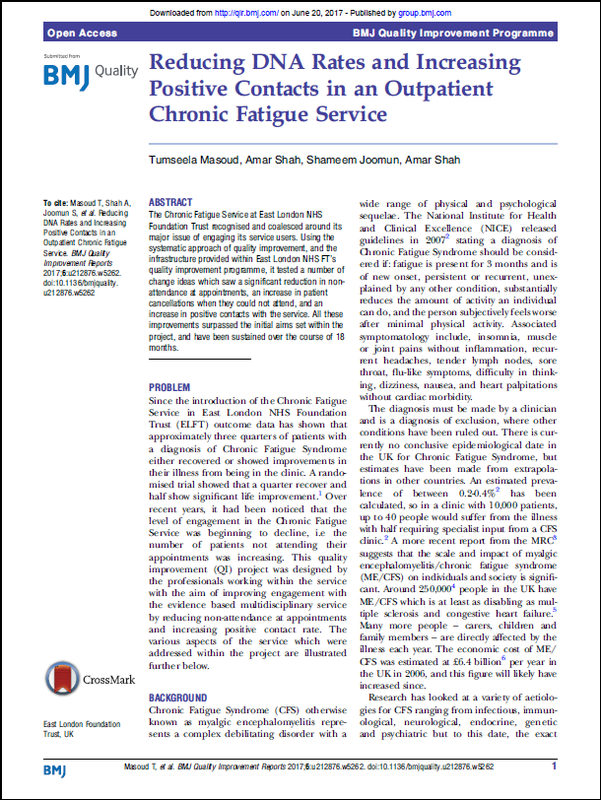 The Chronic Fatigue Service at East London NHS Foundation Trust recognised and coalesced around its major issue of engaging its service users. Using the systematic approach of quality improvement, and the infrastructure provided within East London NHS FT’s quality improvement programme, it tested a number of change ideas which saw a significant reduction in non-attendance at appointments, an increase in patient cancellations when they could not attend, and an increase in positive contacts with the service. All these improvements surpassed the initial aims set within the project, and have been sustained over the course of 18 months. 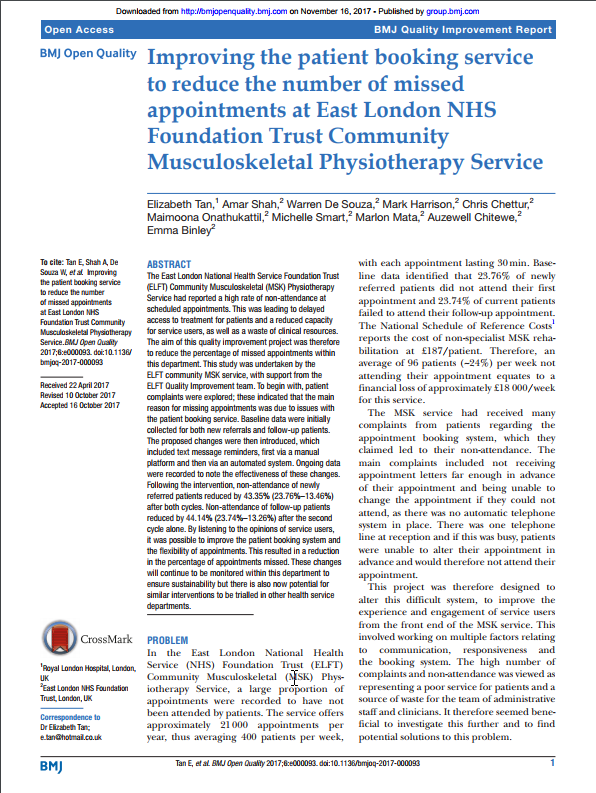 The East London National Health Service Foundation Trust (ELFT) Community Musculoskeletal (MSK) Physiotherapy Service had reported a high rate of non-attendance at scheduled appointments. This was leading to delayed access to treatment for patients and a reduced capacity for service users, as well as a waste of clinical resources. The aim of this quality improvement project was therefore to reduce the percentage of missed appointments within this department. 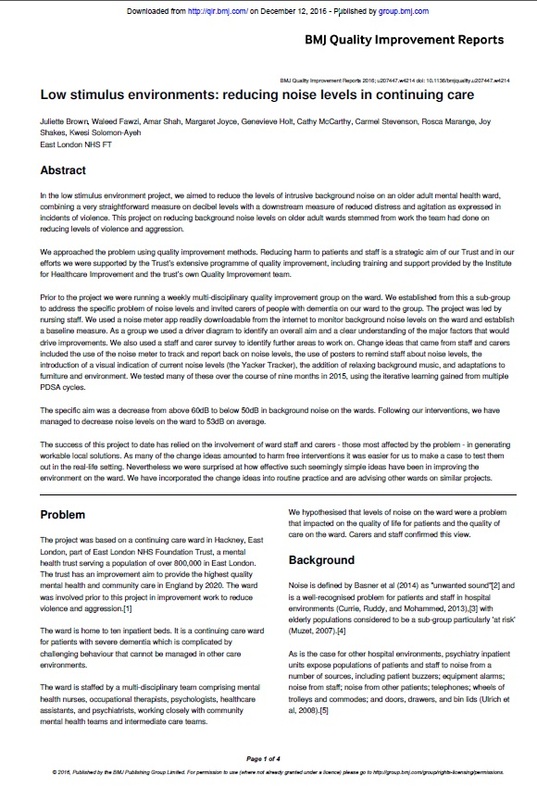 A quality improvement project was initiated on Ivory ward, a functional older adult psychiatric inpatient ward at Newham Centre for Mental Health, part of the East London NHS Foundation Trust. The project was started by staff on the ward after it had come to their attention that their ward had the highest bed occupancy and length of stay across similar wards in the trust. The mean bed occupancy in the 9 months before the project started was 87.7%. The mean length of stay on the ward in the 9 months before the project started was 70 days. The team used the model for improvement, which is the trust’s methodology of choice for quality improvement projects, to reduce bed occupancy and length of stay. City and Hackney Adult Mental Health Referral and Assessment Service (CHAMHRAS) is the single point of entry for all mental health referrals to secondary services, with the exception of perinatal referrals, in the City and Hackney region of London, UK. The service was established in 2013 and it was noted that the waiting time for the majority of patients was exceeding the 28-day target set by local commissioners. Indeed, in December 2014, only 30% of patients were being seen within this time frame. The aim of this quality improvement project has been to decrease the average waiting time from referral to first face-to-face assessment, and concomitantly increase the proportion of patients being assessed within the 28-day target period. Click on the image to read the full paper. While there is a growing body of evidence confirming the benefits of quality improvement in clinical settings, there has been little exploration of or published literature on applying a systematic approach to improvement in non-clinical areas. Learn more in this article by Dr Amar Shah, Marco Aurelio and Mason Fitzgerald. 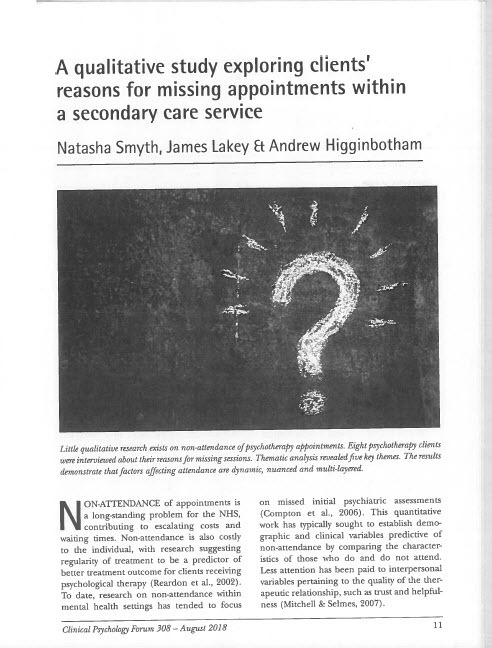 Little qualitative research exists on non-attendance of psychotherapy appointments. Eight psychotherapy clients were interviewed about their reasons for missing sessions and thematic analysis revealed five key themes. The results demonstrate that factors affecting attendance are dynamic and multi-layered. Read this article by the psychology service in Newham to find out more. Please click on the image to access the full article. The focus on this project was to improve access to community-based services, one of four priority areas of improvement work at ELFT between 2015 and 2017. 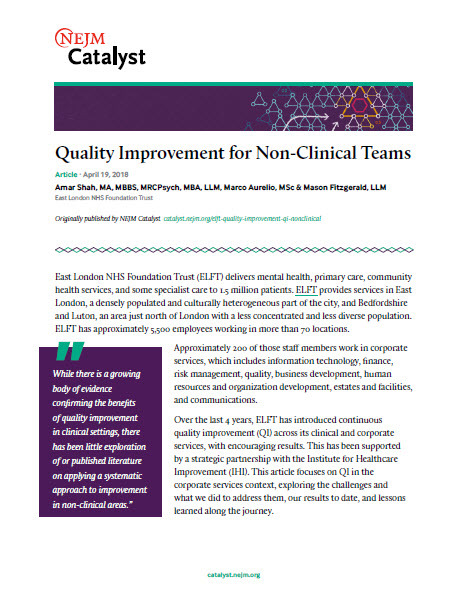 Quality improvement (QI) at ELFT operates on the ethos that improvement efforts should be identified, initiated and led by teams that have the closest proximity to the quality problem. 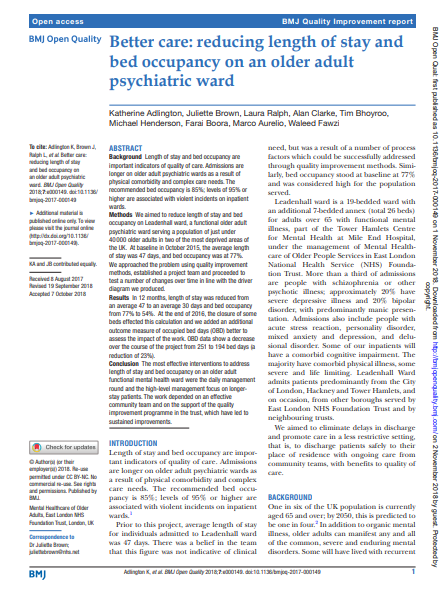 occupancy on Leadenhall ward, a functional older adult psychiatric ward serving a population of just under 40 000 older adults in two of the most deprived areas of the UK. In 12 months, length of stay was reduced from an average 47 to an average 30 days and bed occupancy from 77% to 54%. Please click on the image to find out more.